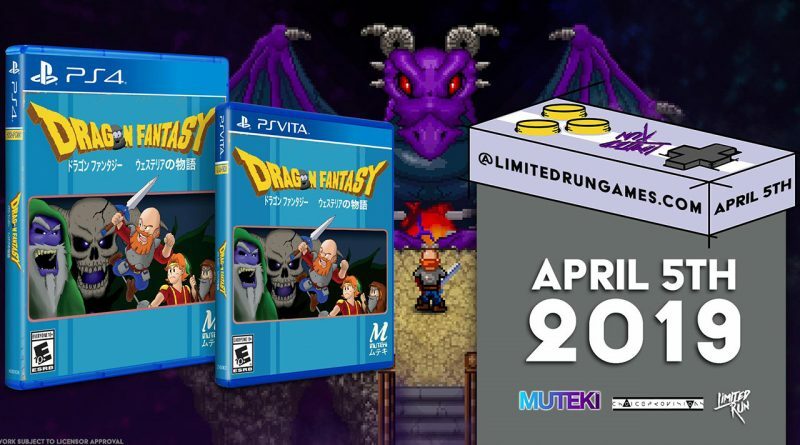 Limited Run Games has announced that the physical release of Muteki’s Dragon Fantasy: The Volumes of Westeria will be available for PS Vita and PS4 on April 5, 2019. The first batch will go on sale at 10am EST, followed by a 2nd batch at 6pm EST. Experience an all-new old adventure. Fight your way through hordes of strange, silly, and scary monsters. Explore the caves, castles, and dungeons of an ancient evil. Meet warriors, princes, pirates, zombies, and crazy old woodsmen in a huge world of epic retro adventure. Authentic 8-bit artwork and an original soundtrack by renowned Bay Area 8-bit musician Crashfaster keeps the game true to its retro roots.